A.P.E.X. 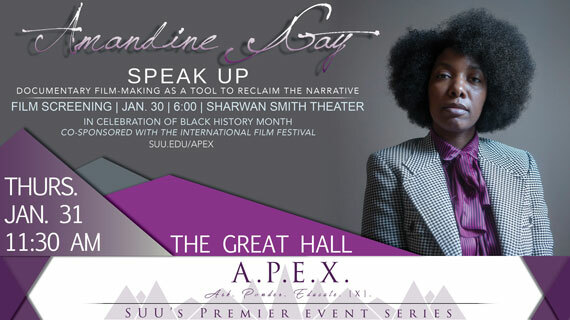 Events and the SUU International Film Festival present the Afro-feminist filmmaker, activist, and journalist, Amandine Gay. Her A.P.E.X. event will be a discussion reflecting on her experience making her film and how the film expresses her message of activism. Ms. Gay will be presenting her film Ouvrir la voix (Speak Up! ), in the Sharwan Smith Theater on Jan. 30 at 6:00 PM. She will be speaking about her use of film to reclaim narratives as part of the A.P.E.X. Events Series on Jan. 31 at 11:30 AM in The Great Hall on SUU’s campus. Both of these events are free and open to the public. Speak Up! is a film about francophone European black women from the diaspora. Speak Up! showcases art performances and compelling storytelling from those who are usually spoken of or spoken for. The film focuses on common experiences related to minority status in predominantly white ex-colonial countries, while highlighting the great diversity of Afropean communities. Speak Up! aims to bring to light the powerful existence black women at the crossroad of multiple discriminations. Speak Up! is a statement about narrative and the identity of who tells the story. Following her graduation from the Institute of Political Science in Lyon with a masters in communication, Amandine Gay joined the Conservatory of Dramatic Art in Paris at age 16 and began performing in theatre, film and television. She is also a contributor to the information website, Slate.fr. Most recently, Gay authored the preface of the first French translation of Bell Hooks' seminal, Ain't I A Woman. Gay is currently living in Montreal, completing her second master's degree in sociology, focusing on transracial adoption.